In February 1921, the Red Army invaded Georgia, capturing Tbilisi and then the rest of the country. The communists declared the “Georgian Soviet Socialist Republic” and began a mass persecution of the Orthodox Church in the country. Also in February, Patriarch Dimitrij of Serbia invited the leaders of ROCOR to relocate from Istanbul to Serbia. Meanwhile, the same month, the Serbian clergy union held an assembly and renewed their call for the Church to allow widowed clergy to remarry. In March, Metropolitan Dorotheos, the powerful Locum Tenens of the Ecumenical Patriarchate, died in London. In the spring of 1921, Russia, having already been devastated by three years of civil war and Bolshevik rule, was beset by a brutal famine that lasted for the next two years, killing an estimated 5 million people. In April, Patriarch Tikhon appointed Metropolitan Evlogy Georgiyevskiy to administer the Russian Orthodox parishes in Western Europe. In May, as Jewish migration to Palestine continued, deadly riots broke out in Jaffa and spread throughout the region. Shortly after this, Patriarch Damianos of Jerusalem attempted to call a Holy Synod meeting, but only a portion of the members of the Holy Synod heeded the summons. In response to the continued dissension among the Holy Synod and the ongoing financial crisis facing the Patriarchate, on June 17 the British government in Palestine issued a decree, essentially expelling all of the Patriarch’s opponents from the Holy Synod and setting up a British commission to manage the financial affairs of the Patriarchate. In June, Metropolitan George of Warsaw, primate of the Polish Orthodox Church, signed an agreement with the Polish government to establish the Church of Poland, in opposition to the Russian Orthodox Church that claimed Poland as part of its canonical territory. Three Polish bishops opposed this action, and, according to news reports, Metropolitan George had them deposed and banished to monasteries. On August 31, the Council of Bishops of the Serbian Orthodox Church decided to take ROCOR under its protection. 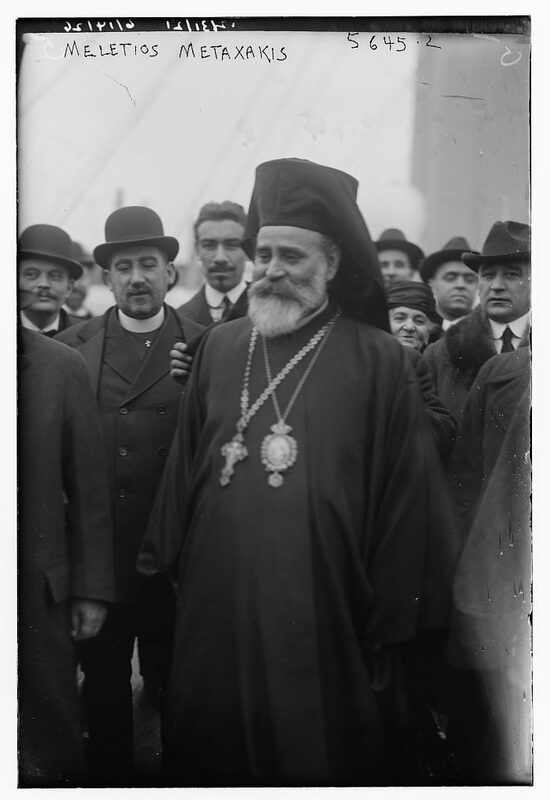 In September, Archbishop Meletios Metaxakis presided over the first-ever Clergy-Laity Congress of the newly reconstituted Greek Archdiocese of America. In October, a group of Ukrainian clergy and laymen – but no bishops – gathered in an “All-Ukrainian Sobor” and attempted to create an autocephalous church. This group purported to consecrate their own hierarchy, themselves, although none of them were actually bishops to begin with, making it totally impossible to establish anything resembling a legitimate hierarchy, even in external form. In late November, ROCOR held its first-ever council, in Sremski Karlovtsi, Serbia. Meanwhile, on November 27 – while the first ROCOR council was taking place – the Ecumenical Patriarchate finally held an election to fill its long-vacant throne. Out of the 68 bishops entrusted with a vote, only 13 were present at the meeting, while 5 more gave their vote to one of those 13 attendees. So that left 18 votes, and 16 went to Meletios Metaxakis, Archbishop of Athens, who was in America in a sort of quasi-exile. Seven of the absent bishop-electors were metropolitans who comprised a majority of Constantinople’s 12-member Holy Synod of Constantinople. These metropolitans gathered in Athens and refused to recognize Meletios’ election as valid. They sent a telegram to Meletios, who was in America, ordering him not to come to Constantinople. He ignored the telegram. Meanwhile, the Holy Synod of the Church of Greece deposed him. Meletios ignored that, too. The Ecumenical Throne was about to get its first occupant in over three years — a man whose vision of a new kind of Ecumenical Patriarchate would usher in our current epoch in Orthodox history.